UK High Streets are expecting a tough 2011, with the impending VAT rise and fears about the economy eroding consumer demand, a survey indicates. Nearly two-thirds of big retailers told the British Retail Consortium (BRC) they expected to do worse than in 2010. Another survey, by analysts Synovate, showed a 22.8% fall in the number of shoppers on Boxing Day this year. The gloomy news came as big department stores John Lewis and Harrods began their post-Christmas sales. 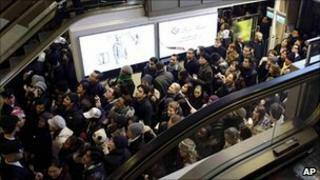 Unlike many other retailers, the two had remained closed on Boxing Day and were expecting a major surge in shoppers. John Lewis said its figures for the week ending on Christmas Day showed total sales of £97.1m, a rise of 30% compared with the same week in 2009, despite the disruption caused by snow. The firm's head of selling operations, Maggie Porteous, said the store was "thrilled to have finished the pre-Christmas period on such a strong note as the slight thaw in the weather released some pent-up demand". Other High Street shops were also expecting a rise in sales, given that Boxing Day had been subject to Sunday trading laws that limited shops' opening hours. The BRC surveyed 17 major retailers, accounting for 51% of UK retailing by turnover, between 22 November and 1 December. It found that 64% of them thought retail sales would worsen in 2011, against 18% who expected an improvement and 18% who thought conditions would stay the same. Media captionRichard Dodd of the British Retail Consortium says retailers are "less optimistic than they were a year ago"
When asked what their biggest worries were, 82% said weak consumer demand and 76% cited inflationary pressures. However, 47% of retailers still intended to create jobs next year, while 24% expected to reduce the number of people they employed. BRC director general Stephen Robertson said that the rise in Value Added Tax (VAT) - which increases from 17.5% to 20% on 4 January - was concerning traders. "Our snapshot shows retailers expect a difficult December to be followed by a tough 2011," he said. "They believe the VAT rise will contribute to higher prices and, with fears about government cuts and the wider economy, people will be put off spending." The Synovate survey measured the number of people visiting more than 6,000 non-food stores on Sunday. Although the overall numbers were nearly a quarter lower than on Boxing Day 2009, there were big regional variations, Synovate said. London shops saw 11.4% more visitors, while their counterparts in south-west England suffered a 27% fall in shoppers.